One of the many phenomena I find endlessly fascinating is embedded in the notion, “The more I learn the more I realize how little I know.” It goes hand in the hand with the metaphor of learning as starting in the middle of a dense and gigantic forest with the job of clearing out trees. At first you can only see maybe a dozen trees. After you clear out that first dozen, you can see 50 trees. Clear out those 50 and you see 500 trees and so on. The more you clear the more you realize how big a task you’ve taken on. Let that notion float around your head for a few minutes and then tune your TV to one of those political talking head shows. Doesn’t matter who’s talking… Could be a Republican, Democrat, Libertarian, Socialist, Emperor, whatever. Whomever it is will be pontificating about how he or she knows all about Problem X and how to solve it. 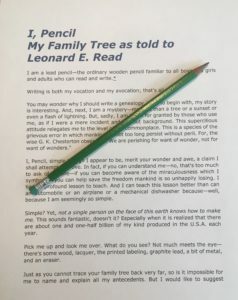 Anyway… if I were king of the world, I would require literally everybody to read Leonard Reed’s 1958 essay “I, Pencil” every year. Politicians would be required to read it every month. It’s nothing short of brilliant. It’s not only a treatment for having too high an opinion of one’s own knowledge, it’s a superb, totally math-free introduction to economics and the science of emergence. Follow THIS LINK to read I, Pencil! My sense is that many people are just not willing to follow this advice, including those with the power and those who don’t as well.